Introducing Norman! Norman is a low-key, handsome fellow who came to the shelter when his former family was moving and couldn't take him along. 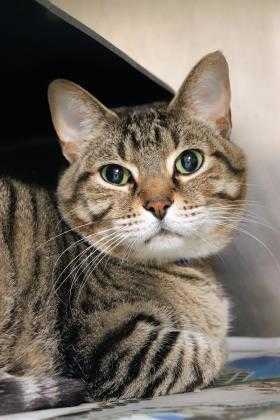 Norman is a calm, quiet sort of guy whose favorite thing is to take nice long catnaps! Norman can sometimes hide at first when people come to visit, but comes out to visit when comfortable. Norman did live with another cat in his former home and may be a great new friend for your present older feline after the proper introductions. A sweet boy who just wants a home where he can relax and get lots of love. Can you make Norman's dreams come true? Stop by today and say hello!